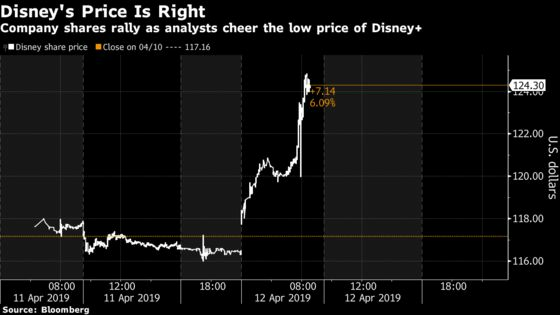 (Bloomberg) -- Investors left Walt Disney Co.’s investor day exuberant as the company’s full-fledged foray into streaming came at a $6.99 per month price-tag, undercutting Netflix Inc. The stock rose as much as 12 percent on Friday to a record high, while Netflix fell as much as 5 percent. Analysts are excited about the massive opportunity Chief Executive Officer Bob Iger laid out, with better-than-expected metrics for Disney+ over the long term. The attractive price point suggests “a steep initial ramp in subscribers” to JPMorgan, as Disney guided for 60 to 90 million users by fiscal-year 2024. But it may not be smooth sailing from here. MoffettNathanson LLC lowered its earning-per-share estimates through 2022 given the anticipated investments needed for the new product. And while SunTrust continues to expect Disney+ to “present manageable incremental competition” for Netflix subscriber adds, the firm does not view the new streaming service as a strong alternative to the incumbent. “Overall we walked away from the meeting very encouraged about the outlook and its likely success," wrote Quadrani in a research note, though profitability for Disney+ is not expected until fiscal-year 2024, which may prove conservative. For Netflix, Thornton continues to expect Disney+ to “present manageable incremental competition” on new subscriber adds and feasible impact on churn. Disney+ features family content, while Netflix offers a much broader range of content with majority of the most-searched content spanning adult drama, comedy, horror and suspense, anime, documentaries, and international. Thornton does “not view Disney+ as a strong alternative” to Netflix. Disney’s near-term investments to generate bigger gains in the long run is the “right thing” to do, writes Nathanson in a note. The firm lowered its fiscal-year 2019 EPS estimate by 5c to $6.25, but the bigger negative revisions come in FY 2020 and FY 2021 with lower EPS estimates. After incorporating new expectations, Evercore expects near-term earnings estimates between fiscal years 2020 to 2022 to come down, though longer-range forecasts should increase.